Kyuu is your average boy with a knack for logic and reasoning. Desiring to become a detective, he finds out about the existence of the Dan Detective School (DDS); a famed school where students are allowed to bear arms. Together with Megu, a girl with photographic memory, the martial arts master Kinta, the genius programmer Kazuma and the mysterious Ryuu, Kyuu tackles many well planned out crimes, always seeking the truth. Tantei Gakuen Q is pretty much just another detective show with fairly interesting mysteries for all the detective addicts to get high on. Based on the manga by Seimaru Amagi and Fumiya Satou, Tantei Gakuen Q is about the young Kyuu, who is talented at deduction and reasoning. He eventually enrolls into the famed Dan Detective School, a specialist school that train students into detectives. He befriends a number of the other students in the school, each with their own specific talents. Together their group tackles a number of mysteries and crimes that occur. Tantei Gakuen Q is episodic, with each episode mostly focusing on different crimes that occur around Kyuu and his friends. There are a number of multi-episode mysteries in the show, which in my opinion are much more interesting, witty and detailed compared to the one-shot mysteries. Majority of the mysteries are fun to watch, with some crimes containing tricks that are incredibly complicated. Occasionally the story may drift to cheesiness, and certain parts may be quite predictable. A plotline runs throughout the entire series, although the main focus of the show is still on the specific crimes in each case. The ending of the anime, unfortunately, is rather unsatisfying, with the previously mentioned main plotline finishing off rather unresolved. The animation is rather plain, and contains nothing special. Occasionally, characters may appear disfigured, but with the focus of the viewer on the mysteries occurring in the show, animation is most likely the last thing on everyone’s minds. Character designs are simple and more or less unappealing. It is a wonder with the logical nature of this show why the main character has green and white hair (even as a child). For the sound, voice acting is satisfying. No character really stands out with an incredible voice actor although you may find one or two characters with a VA that you would rather not have to listen to. The background music is rather enjoyable to listen to, if not overused in the show. You’ll most likely not complain if you like it enough that you wouldn’t mind the same piece to be played over and over again. The openings and endings are rather unmemorable. Especially with the cliffhanger endings in the show, a lot of people would probably rather skip through the opening if they could. With that said, the openings and endings are not bad per se, and I find the first opening to be excellent. Characters are not really the strongest point in the show. Character development is near non-existent, from the beginning to the very end; characters more or less still act the same (with an exception of a few individuals). Each of the main characters have their own specific traits and talents, and help out in each of the cases using these traits. The teachers in the show are hardly ever seen, and are pretty much forgettable. The criminals are rather generic, with their weak revenge driven hearts, anger, greed, selfishness or tragic upbringings or events that lead them to do their crimes. As for why I like Tantei Gakuen Q, the tricks used in the show were fascinating. I did not really care much for any other aspect of the show; the mystery was pretty much the only thing I found really going for it. The drama in the show was frankly rather annoying and cheesy to watch most of the time. I also wish the show wasn’t aimed at kids. Overall, Tantei Gakuen Q is pretty much an anime that the mystery and detective lovers would probably like the most. It doesn’t have much else going for it except for the specific stories in each of the cases. If you would like to give your deduction skills a try, go ahead and watch Tantei Gakuen Q. All hints are always given and fully explained in the show. Be warned though, some of the tricks are complicated and not exactly the sort of thing an average person is going to suddenly think up. If you're a mystery maniac or just looking for an entertaining series to watch, you can't go wrong with this one. Although the age of the characters belies the depth of each case, its a good plot for anyone who once and still wishes to be like sherlock holmes, nancy drew, etc. Imagine a school that actually develops one's deduction skills at a very young age. The graphics could use a bit more improvement, but nevertheless the cases are varied -- ranging from light to crimes that leaves you feeling regret and pity for the characters involved. There are plenty of funny scenes, and suspense especially when the good detectives meets with the antagonists. The ending's a bit lacking, since there are no final results on the crime group that the detective school are fighting against, and there's no closure either on one of the character's story. All in all, the main attraction for this anime is the interesting cases the students solves, and how they came up with the results behind it. Who would've thought Studio Pierrot would ever do something correctly? Tantei Gakuen Q-- or Detective Academy Q, is a show about a boy with a talent for logic and reasoning. Wanting to become a detective after being saved by one during a kidnapping; our main character Kyuu finds out about the existence of the DDS, Dan Detective School, a school formed by the legendary detective Dan Morihiko. After meeting Megumi, a girl with photographic memory, the martial arts master Kinta, the geeky programmer Kazuma and the mysterious Ryuu, Kyuu and his friends join "Class Q" at DDS, and tackles many difficult crimes, always seeking the truth. The story is very simple and not very thought out : a boy and his friends are always involved in some kind of crime they have to solve, and pretty much always find the culprit at the end. 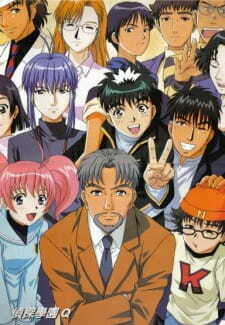 Even though the premise is fairly simple and not very original, the cases are actually very well thought-out, rarely obvious, and the show always give enough information for the watchers to actually solve the mystery and find the culprit, which is a good thing, because following a mystery you can't solve yourself is pretty boring. The show is mainly episodic, with some arcs spanning two to four episodes, though later on there's a subplot going on. However, it is never fully explored since the anime ends with an open ending without any kind of continuation. Unfortunately, it seems the author ran out of ideas near the end, as the latter cases seem to be very similar to the first ones; and the culprit's motives are also pretty much the same. In the end, I was still highly satisfied, but the flaws are quite apparent. I would say the characters of the show are far from original and follow the typical shounen jump archetype. The best example would be the main character himself, Kyuu, who's just a normal boy that aspires to be a detective because the person he looks up to is also a detective. And like every other shounen jump story, the main character has a motto he always follow-- In Gakuen Q, that would be "A detective must never give up, or the case will remain unsolved." It is very cheesy and unoriginal, but let's not forget Gakuen Q is a show for (apparently) children to begin with. And finally, Ryuu is a badly written character. He is pretty much a Gary Stu. He has no real flaws, he's always smarter than anyone else, he's never wrong either. He is also mysterious but his past is pretty lame and not thought out at all. The animation type is very cartoony, which is fitting because it's a show for children. The art style reminds me of Kindaichi, but that's simply because both are by the samr artist (and author.) The character design isn't bad either, except for Megumi who has very funky hair and a badly proportioned body most of the time. Gakuen Q is kinda old, so the animation isn't the best there is. Not only that, but Studio Pierrot is known to mass product long running anime, so the animation quality is even worse than it would usually be. Surprisingly enough, there aren't many repeated frames, which is a good thing. Don't worry though, the animation gets better as the shows goes on. Pierrot probably noticed it was getting a bit more popular and decided to put more effort into animating this. This anime doesn't really need ultra high quality animatio anyway, as characters are usually not moving that much, contrary to action shows like... I dunno... just think of one yourself. The voice acting isn't too shabby, but Kyuu's voice was very annoying at the beginning. The voice actor always made him speak on a high pitch, and it didn't really fit the character. The rest of the cast is very well acted, I have no complaints. I won't comment on the OP and EDs, they are just... generic. Background music was spot on-- it always played at the right time and most of the songs are also pretty good. I was surprised because I expected the BGMs to be forgettable, but a few emotional scenes made some BGMs hard to forget for me. The best song is probably the one that usually plays when a culprit confesses of his crimes. Unfortunately, I don't think this anime has a high rewatchability. Mystery anime are often like this, the main thrill in watching a mystery is to solve it. Once it's solved, nothing's really thrilling anymore, right? I would probably just rewatch the Ichinose arc, definitely my favourite! In the end, I think anyone of any age can enjoy this show. While some characters are pretty bland, the mysteries are very interesting, and as I said earlier, there is always enough information to solve the case by yourself, making this show a very enjoyable watch with lots of interactivity. I recommend this to people who like reasoning and logic. This crime anime may seem somewhat childish at first, but eventually a true appreciation for the intricate plots both episodically and arcing emerges along with a respect for each character. There are emotional angst-y parts nicely balanced with adorable comedy and character interactions. Fun to watch alone, but even more fun to watch with another friend or two to guess "who done it" for each mystery plot ; ) For an anime with murders as the most common crime there is very little bloody violence, so good for younger and older crowds. Do you love detective stories? Ones that keep you guessing who the criminal is? Action filled clashes between good and evil? Or maybe it's a battle of the mind between detective and criminal that gets you going. Whatever your bias, read on for some great recommendations! There’s a dead body in the room, but the door is locked from the inside. Is the locked room mystery the setup for the perfect crime? Not if these detectives can help it!